The Decades of Style Trunk Show has been extended! Stop by Treadle anytime now through January 6th to see all of the wonderful sample garments on display. If you see a garment you like, you can purchase the pattern at Treadle! We carry the full line of patterns from this great independent company. Treadle's annual Winter Clearance Sale starts this Wednesday, Dec. 26th. Stop by and enjoy discounts of 20-50% on selected fabrics. We will be closed on Dec. 25 and Jan. 1 & 2. Happy holidays from all of us at Treadle! Still looking for a last-minute gift? Treadle has you covered! Cat In the Hat fleece panels (seen here) are back in stock. Nothing could be easier; just cut the panel (or have us do it for you) and bind or fringe the edges. We have coordinating allover prints if you want to back your panel. Sewing kits are a great little stocking stuffer, even for those who don't sew much, since everyone needs to replace a button now and then. We carry many styles in handy cases. We also have a beautiful selection of employee-made gifts, including baby booties, holiday ornaments, needle cases, pincushions, and more. The rayon batik scarves are ideal gifts. With so many colors and patterns, you'll find one for everyone on your list. 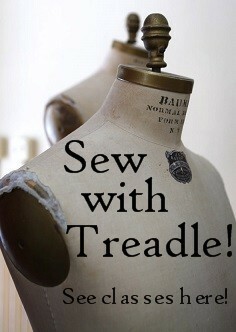 And of course, a Treadle gift certificate is always appreciated by the discerning sewist! These cotton prints are emblazoned with vintage Nancy Drew book covers and illustrations. The large panel features full book covers; the coordinate fabrics include little magnifying glasses on black and a bookshelf complete with various Nancy Drew titles on the spines. We have a couple bold new prints at Treadle from Frond Design, a small, Midwest-based design group that's been in business since Fall 2011. We have a wild, large-scale panel print and a coordinating allover repeat print. Every other repeat of the panel is a mirror image. 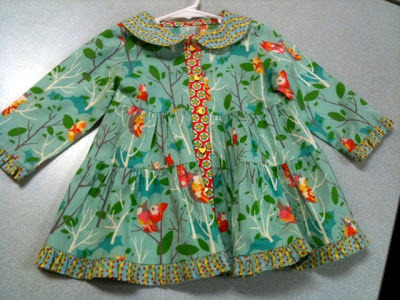 Both of these pieces are from Frond's Alexis' Winter Garden line. We all know and love the vintage buttons available at Treadle. Now Becky, our vintage button supplier, has put together these charming button trees. This would make a perfect gift for the button enthusiast in your life, or even frame it for a unique holiday decoration. Currently at Treadle we are pleased to be hosting the Decades of Style Trunk Show! This independent pattern company produces vintage designs for the modern sewist. Working with authentic vintage patterns can be tricky, but with Decades of Style you get clear directions and a wide range of sizes to make vintage style accessible to everyone. The entire line of patterns is available for sale at Treadle. Stop by Treadle to see the wide range of beautiful Decades of Style sample garments displayed in the store! Now through Dec. 24th. In addition to holiday-themed fabrics, we also have a selection of holiday ribbons. The brocade and jacquard ribbons would make a colorful trim for a craft project or a little girl's party dress, while those printed with words are perfect for tying gifts. We've been lucky to have a great selection of Pendleton wools this season at Treadle. A few days ago, we got a shipment of even more beautiful fabrics from this distinctive manufacturer. From the bright, striking patterns and plaids of their signature pieces to smooth, dress-weight wool sateen solids, there is a Pendleton wool for every garment. Come in and see! Join us tomorrow, Saturday, December 1st, for the Grand Meander! Shops all up and down Grand Avenue are participating in this festive annual event, with an art crawl, soup tastings, music, and more. Stop by Treadle for a cookie and a free gift bag kit (while supplies last). And enjoy 30% off our wide selection of holiday print fabrics all day! Everyone at Treadle loves this wool/viscose blend coating. Knitted and then lightly felted, this fabric has a soft drape, slight stretch, and a nubbly texture that's delightful to touch. Since it's felted, it resists fraying, making it a perfect choice for unlined, deconstructed garments like simple jackets and wraps. We have an array of colors, including black and white. For a thicker, denser fabric, you can machine wash and dry it to felt it even further. Expect about 25% shrinkage, and buy your yardage accordingly. BLACK FRIDAY, SATURDAY, & SUNDAY????? At Treadle we are celebrating the beginning of the holiday gift making and giving season with savings for you. We invite you to visit Treadle on Friday, Saturday and Sunday, November 23, 24, and 25 for savings of 20% on all fabric and ribbons. Enjoy 20% off all regularly priced fabrics and take an additional 20% off all sale fabrics. Sew up a fun hostess apron, cozy flannel loungers, unique pillowcases, or a warm Shetland wool muffler or poncho. We have the ideas, know how, and raw materials to help you find something for everyone on your list. We look forward to seeing you! Look at these beautiful little ornaments made by Treadlette Rebecca from wool felt! 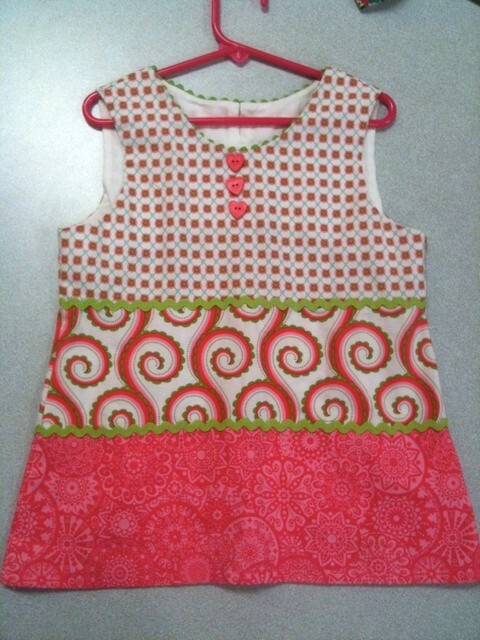 Rebecca used McCall's pattern 6674, which requires no sewing, just careful cutting; the pieces are joined with iron-on fusible web. She reports that a small, sharp scissor with pointy tips is a must. We have this wool blend felt in so many colors for all your crafty needs! Check out some of the amazing patterns, or pick up one of the many felt-crafting books we have in the store. Plaid is so popular again, and we have so many attractive new plaid fabrics right now. A particularly nice groups is this selection of Viyella plaid shirtings, a cotton and wool fabric just right for chilly weather. These smooth, lightweight fabrics are a soft, washable blend of 80% cotton and 20% wool. They're the perfect thing for a custom-fitted shirt that can take you (or your guy) from autumn into winter with a jacket or sweater vest. These luscious coatings were a hit last year, and now they are back in even more colors. This poly/acrylic blend is thick and soft, with multicolored yarns couched over the surface. Rich in color and exploding with texture, this coating is a tactile treat. The striped fabrics have the surface yarns packed close, while the swirled fabrics leave some background visible for a more dynamic effect. Perfect for contrasting elements such as collar and cuffs on a solid coat, or an eye-catching handbag. Or be bold, and make a whole coat for a stunning look your friends will envy. We have so many new pieces of silk in the store. Here are a few that caught my eye. This silk shantung has a striking handpainted effect and smooth, crisp drape with just a few slubs. This chiffon, one of several, is just subtly iridescent. The striped silk crepe is soft and drapey, with a subtle bit of crinkly texture and rich autumn colors. Come in and shop our silk! We have so many more new pieces in the store. We have a lovely group of new fleece coating in the store. Solid, thick, and soft, this fleece isn't what you'd make little fringed blankets out of. Evocative of wool Melton, this poly/rayon/spandex blend is a wonderful garment-quality fabric, perfect for coats, jackets, or vests. It's what fleece wants to be when it grows up. We've added several new colors to our incredibly popular selection of silk/rayon velvet. Irresistibly touchable, with a shimmery drape, this velvet is the ultimate luxury fabric. Add some velvet accents to a wool crepe dress for an elegant holiday outfit, or use it to make a chic little purse to tote your essentials in. A velvet scarf makes a lovely gift, and there are so many ways to make them. Or truly pamper yourself and make a velvet coat! There are so many more in our store. Come in and take a look! We have several luscious pieces of faux fur new in the store. Made of polyester or poly-blends, these high-quality animal-friendly furs are dreamy soft, thick, and luxurious. You could use this fur to make a coat, or just add a little pop by making fur cuffs and collar on an otherwise plain wool coat. Or make a fur bag or muff lined with satin for retro appeal. Treadlette Jess made this lovely ensemble in two of our beautiful new wools. A short cape with arm slits extending to the hem floats over a neatly fitted straight skirt. The pattern is New Look 6152, with the cape made in the shorter length in a lovely plaid, which she carefully matched at the princess seams. The asymmetric closure uses a single large button with elastic loop. Jess made the skirt in a coordinating deep teal herringbone wool, and perked up the whole ensemble with a bright, splashy lining. Way to go, Jess! Among the many new knits we have right now, this group caught my eye. These softly heathered cotton blend double jersey knits are reversible, with a deeper shade of the same color on the opposite side. A little spandex stabilizes the fabric, and the two layers are machine-joined with tiny pick stitches that lend a subtle surface texture. Thick and lofty, this fabric would be ideal for a cozy shirt or simple fall jacket. A deep cowl over an A-line shape would be a beautiful way to take advantage of both the reversible quality and the cuddly softness. We have so many lovely new flannel prints this season. Here’s a group with leaf and tree prints that’s much more adult than many of our novelty flannels, while still being playful and attractive. These would make wonderfully soft and easy pajama pants or a warm and whimsical shirt. This group of soft shirtings in muted tones is perfect for autumn. These soft cotton fabrics feel warm against the skin and drape easily around the body. Available in solids, stripes, and assorted small woven patterns, they are perfect for a man’s comfortable button-down shirt for dressed-down weekends or a casual family gathering. Or try a blouse or dress to layer with a cardigan sweater. We have many new bolts of printed corduroy in the store for autumn. This fabric is quite fine, with narrow wales and a soft nap, and drapes beautifully. The more whimsical prints would be ideal for a little girl’s simple jumper, while some of the florals would work wonderfully in an adult garment like a skirt or dress. Upcoming Class: Sewing Cute Clothes for Kids! This class with the Material Girls is designed for the busy mom with little time but would love to make cute clothes for their child. 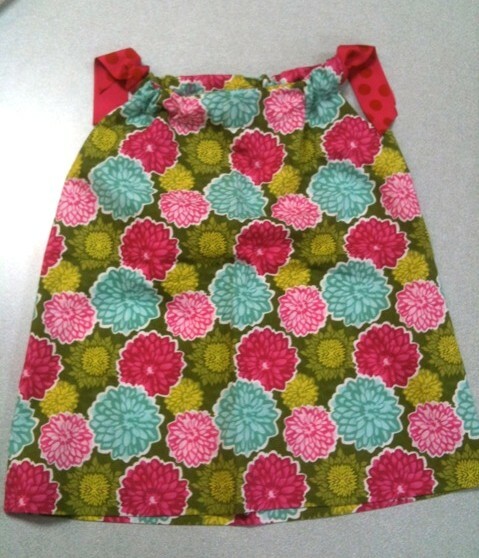 We will select several patterns, get you started in class and lay out steps for you to complete at home. Beginners are welcome. Come to one session or all. Fun group sewing time! 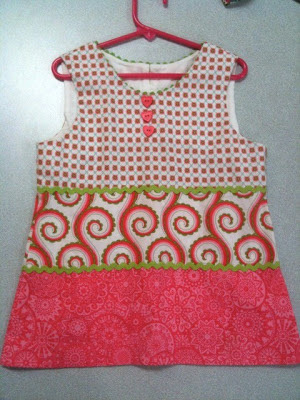 Projects include a super simple pillowcase dress, pants, shorts, button dress, pajamas, and more! Kristin and Debbie will help you select a project that's right for your skill level. The first session is next Wednesday, October 24th. To sign up for the class or for the list of recommended patterns, stop by the store or call us at 651-698-9690.